The structure are the parts of the building fabric which provide significant strength, stability and integrity. This includes the floors, walls, frameworks, roof carcassing and foundations. Subsidence, settlement, heave, sway, bouncy floors, bulging walls, cracks, expansion and contraction are all forms of structural movement. Buildings and other built structures are moving all the time, but usually these movements are so small they are unnoticeable. Almost all buildings are designed and constructed to allow for some degree of movement. If a structure is unable to accommodate this movement, the building will come under duress. Why? Because in a building where you have different elements all moving at different rates, cracks will occur. New structures are designed to carry their own weight and imposed loads so that strains are kept within reasonable limits; safety factors are included to cater for variations in quality of materials, design and construction inaccuracies, and random or accidental forces. Some cracks can look significant which can lead to a state of panic regarding the structural integrity of the property but often these cracks are merely decorative issues. There are several possible causes of structural movement: poor design or workmanship when undertaking alterations; failure of structural components, such as lintels or arches over door and window openings; or foundation failure due to ground movement. Tracing the cracks is usually a good indicator of the source of the problem – if the cracks track down to the ground, there is a good chance this is where the problem lies. Roof Spread – what is this? This occurs where the force of the roof pushing out at the top is not offset by beams at floor and ceiling level applying force to pull the walls back together. This is often observed in a situation where the roof covering has been changed from something lightweight, such as slate, to something heavier. The increased load causes the top of the walls to be pushed out. Cavity wall-tie failure – What is this? – The outer layer of a cavity wall has almost no structural stability. Instead, it relies on the support of the internal wall to hold it upright. A wall tie is used to connect the two walls together while maintaining a suitable cavity. Many years ago, iron wall ties were used which tend to rust and expand over time. This expansion forces the bricks apart. Failing Lintels – Most windows and doors are not structural and so require a lintel to take the load of the structure above and distribute it across the surrounding walls. Diagonal cracks can appear above openings due to the absence, or failure, of a supporting lintel. Sometimes a lintel has not been extended far enough into the surrounding wall which can cause one end of the lintel to slip and cause a diagonal crack through that wall. sulphate attack of cement and concrete. The battle against water can largely be won by giving the building a good roof; by ensuring that driving rain is thrown clear of the building by generous drips, throatings, over-sailing copings and bonnets; and by preventing rising damp either through a damp-proof course (dpc) or by ensuring that the ground is well drained. When assessing the severity of cracks your Chartered Building Surveyor will start with the BRE Digest 251: Assessment of damage in low-rise buildings. This identifies 6 types of cracks. Category 1 – up to 1mm – Damage is generally restricted to internal wall finishes. Cracks are rarely visible in external brickwork. Fine cracks are easily treated during normal decoration. Category 2 – cracks up to 5mm – These cracks are not necessarily visible externally. Doors and windows may stick slightly and require easing and adjusting. Recurrent cracks can be masked by suitable linings some repointing may be required externally to ensure weather tightness. These are typically aesthetic problems and not of any structural significance. Category 3 – 5-15mm – Doors and windows sticking. Service pipes may fracture. Weather tightness often impaired. Cracks which require some opening and patching by a mason. Repointing of external brickwork and possibly a small amount of brickwork to be replaced. Category 4 – 15-25mm – Windows and doorframes distorted, floor sloping noticeably. Walls leaning or bulging noticeably, some loss of bearing in beams. Service pipes disrupted. Extensive damage that requires breaking-out and replacing sections of walls, especially over doors and windows. May require partial. 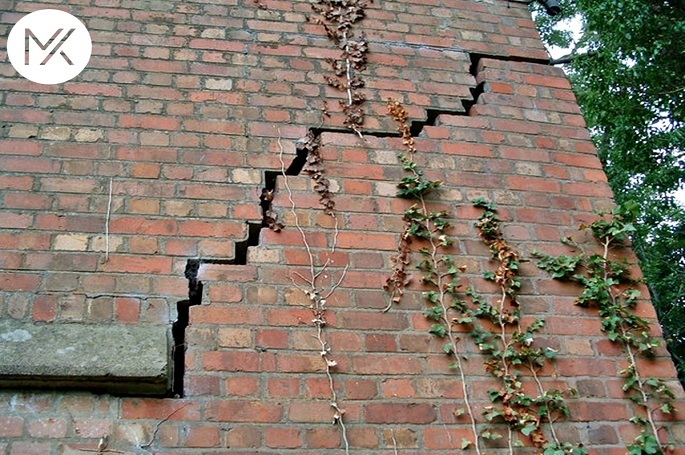 Category 5 – cracks greater than 25mm – require structural intervention. Beams lose bearing, walls lean badly and require shoring. Windows broken with distortion. Danger of instability. Structural damage which requires a major repair job involving partial or complete rebuilding. Other factors also need to be considered, such as the number of cracks. The above classification is a good starting point but your Chartered Building Surveyor will be able to determine whether what they are seeing is a structural issue or just a cosmetic problem. Designers of new buildings may try to ‘design out’ many of the causes that may lead to cracking by careful design of the foundations and superstructure, introducing movement joints, specifying materials that can tolerate movement and so on. Existing buildings should be examined for the likely cause of movement, and whether this is due to an external factor (such as subsidence) or is caused by the fabric of the building itself (such as a poor grade of cement). It is important to establish whether the cracking is likely to be progressive and to deteriorate further, and if so, to what extent and over what period of time. Repair strategies can range from major interventions to limited cosmetic works. However, unless the underlying cause has been dealt with, it is likely that further maintenance work will be required in the future. Founded in 2006 by Michael McKenna, mckenna + associates, based in Trim, Co. Meath is a growing team of friendly, enthusiastic and open-minded Registered Architects and Chartered Building Surveyors. Together we have a background of experience in residential, commercial and industrial projects and share a culture of excellence. With over 65 years’ experience, the team at mckenna + associates will work with you right from the beginning no matter how big or small your project is.